The Bugatti Veyron Grand Sport convertible features the same 16-cylinder, 1001-hp gasoline engine as the coupe version of the supercar. Dana Holding Corp.'s multi-layer steel cylinder head gaskets seal the Grand Sport's W-16 powerplant. The gaskets, supplied by Dana under the brand name Victor Reinz, are made from spring steel (a very high strength steel alloy) and utilize the firm's latest Wave-Stopper technology. This design allows the gaskets to maintain a complete seal at temperatures far higher than conventional units. Dana manufactures the gaskets at its German plant in Neu-Ulm, which is about 100km (about 60 miles) southeast of Stuttgart. Many other suppliers contribute to the vehicle's formidable powertrain, including Sweden's Haldex AB, which supplies the car's all-wheel-drive coupling; Bugatti Engineering GmbH and the UK's Ricardo Plc, co-developers of the supercar's seven-speed dual-clutch transmission, which features a dual-clutch module from BorgWarner Transmission Systems; and Germany's Hoerbiger Antriebstechnik Holding GmbH, which delivers the Bugatti's synchronizer system. A division of BorgWarner Beru Systems GmbH, bf1systems, supplies the Grand Sport's tire pressure monitoring system, which alerts drivers if the tires deflate to a dangerous level. Because the car experiences such extreme conditions - with tires reaching temperatures of about 100 degrees Celsius (about 212 degrees Fahrenheit) and experiencing and forces of 2,900g (compared to 2,000g for regular automobiles) - a conventional TPMS will not suffice. Consequently, Beru supplies its DigiTyre TPMS, a carryover from its Formula One program. The DigiTyre system comprises wheel electronics (including pressure and temperature sensors), an ECU and an antenna. By monitoring tire pressure and temperature, the system can determine if deflation is occurring and its severity. Tires may be losing air very slowly and although the vehicle is currently safe to drive, it will need attention in the future. Alternatively, perhaps tires have deflated to such an extent that handling is already adversely affected; or air is escaping at such a high rate the car will be unsafe to drive imminently. With its removable transparent polycarbonate roof in place, the Grand Sport can reach up to 407kph (253 mph). When the roof is removed the maximum speed reduces to 360kph (223 mph). There is also softtop roof stored in the Grand Sport's luggage compartment. With the softtop roof on, speed is limited to a maximum of 160kph (about 100 mph). 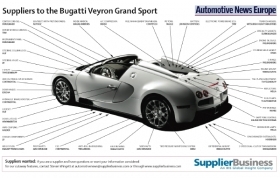 Bugatti began Grand Sport assembly in 2009 at its headquarters Molsheim, northeastern France. Only 150 units were scheduled for production, each with a 1.4 million euro ($1.9 million) price tag before taxes and transport.